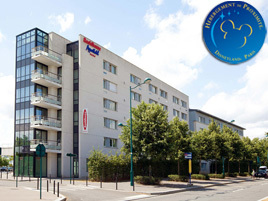 The Val d'Europe Residhome extended stay hotel is located in close proximity to the Disneyland® Paris Theme Parks and the La Vallée Village designer outlet center and offers the highest level of comfort with premium services for all of its apartments. You can satisfy your shopping craving by walking to the Val d'Europe shopping center, to La Vallée Village (prestigious brands at discounted prices), or to the giant, fun, and interactive SEA LIFE Aquarium. As far as sightseeing goes, there's a lot to discover: the medieval city of Provins, the Vaux le Vicomte and Fontainbleau palaces, as well as the Nesles Feline Wildlife Park. Getting to Paris will also be a smap thanks to the RER A suburban train, which will take you to the capital directly from the Val d'Europe train station, located just outside the residence. Open 24 hours a day, the aparthotel has air-conditioned apartments that are designed to sleep from 1 to 7 people, depending on the category. You will especially appreciate their excellent design and their sophisticated, modern, and warm ambiance. Each suite has a fully-equipped kitchen, an office area, an LCD television… and a wide range of services: a high speed internet connection, a safe, parking and for an additional charge, a meeting room. You can also take advantage of the snack bar, open Tuesday to Saturday and every day during school breaks, from 4pm to midnight.